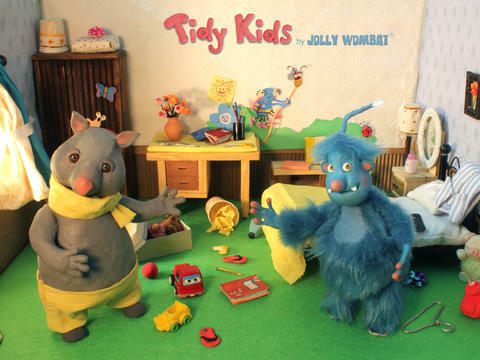 Tidy Kids - Family fun and agility! Developer Quote: "Together you hop, skip, and laugh the room tidy. Check out the stunning plasticine art! Tidy Kids - Family fun and agility! is the most fun you'll have tidying up!" + Tidying up is fun! + Classification and grouping of objects. + Where their things belong. + Taking care of their things. + Not another screen-time pacifier to keep kids quiet and distracted. + Moms, Dads and Kids can play together. + Put the iPad on the floor - Players sit around the ipad like a board game. REAL WORLD AGILITY - GET ACTIVE! + All the action happens in the "real world"
+ Hop, walk on tippy-toes, backwards and more - Players get active and learn about their bodies. + When the game is finished - the room is tidy! BEAUTIFUL PLASTICINE GRAPHICS AND ANIMATION! + Highly imaginative animal characters and backgrounds. + Optimised for Retina Display. 1) Put the iPad on the floor - Players sit around the iPad, like a board game. 3) Press the green arrow to start. 4) The first player uses their finger to "spin" the tidy-task wheel. 5) When the wheel stops, you get your "tidy-up task". 6) When ready, press the arrow to start the timer. The action happens in the room, not on the screen! Get up and complete your task before the music stops! * If the wheel stops on "The Lazy Lump" you miss your turn. * Can you do the Jolly Wombat Dance? The app is full of colorful, motivational plasticine art graphics that instruct your kids on the best activities for cleaning up around them. The retina display is a gorgeous thing to see when used on this artwork. 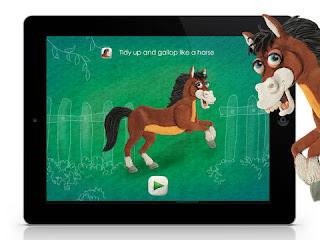 The whole family can play and enjoy Tidy Kids as they sit around the iPad taking turns. COOL CONCLUSION: Completing all tidy up tasks lets kids learn responsibility and have fun at the same time with Tidy Kids - Family Fun and agility!